Orient Express slot is Yggdrasil's tribute to the celebrated London-Constantinople luxury train of the early part of the 20th Century and which still travels today - if you can afford it. The byword for luxury, the Orient Express fed and entertained its passengers through Europe over several days before arriving at the 'gateway to the East' in Turkey. You get to play against a background or 4 different cities en route with soothing Piano-Bar music to accompany you. So will you be on-board for this journey or remain on the platform? Your 5 reels of 3 rows each sit on a transparent background of 4 different cities you travel to en route. 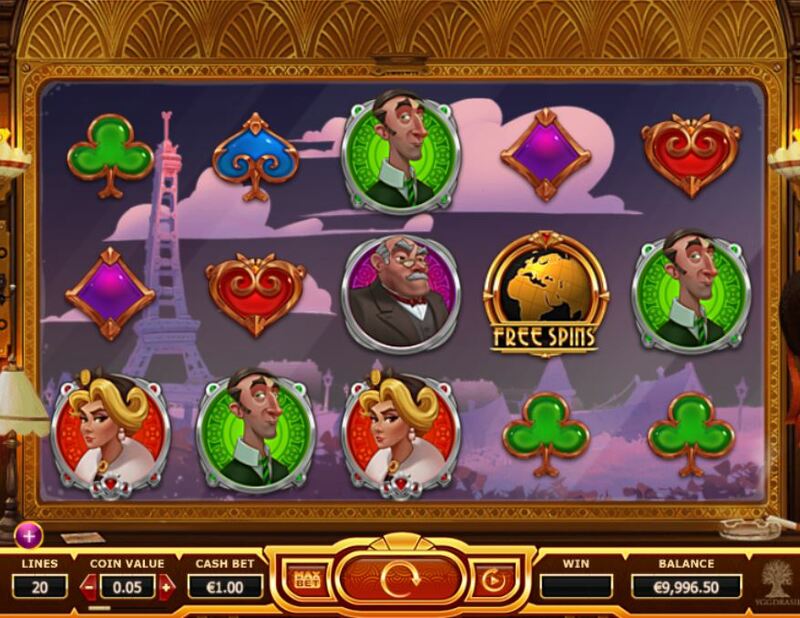 You change the city by triggering the free games bonus and each city has an in-play random feature, which during the free games occurs every spin. Your icons are the Orient Express Wild which appears in all 4 city modes and the Golden Map scatter which awards 7, 15 or 30 free games for 3, 4 or 5 respectively. There are 20 pay lines and the 4 passengers are the premium symbols; the well-heeled lady pays 50x bet for a 5-of-a-kind, the two gentlemen 45 and 40x and the older man 37.5x stake. The remaining icons are card values offering 5 or 3.75x bet. Paris - randomly a butler Wild may appear from mid-air and overlay any symbol on the grid after a spin. This means the reels re-spin until all of them move off the screen, and they migrate one reel leftwards on each respin. 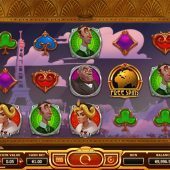 This is same as the Wandering Wild in Netent's Jack and the Beanstalk slot and in the free spins it will occur far more. Venice - This is the second destination and in the base game a multiplier clock may appear after any win and spin to multiply the win awarded either 2, 3 , 4 or 5x. In the free spins all wins are multiplied. Belgrade - The penultimate stop and here in the base game a train may appear on the track below the reels on the right and as it travels to the left it will turn 1 to 3 reels Wild. In the free spins it comes along every spin. Istanbul - This is where the train terminates and here we see postcards randomly fly onto the grid after any spin turning 2 to 12 positions Wild. In the free spins this occurs on every one.